After much speculation, Amazon Prime Video, a video-streaming subscription service officially comes to Canada. Prime Video is a Netflix-like video-streaming subscription service which includes Amazon Original Series like Jeremy Clarkson’s “The Grand Tour”, a popular British motoring television series, and Jill Soloway’s “Transparent”, an American comedy web television series. 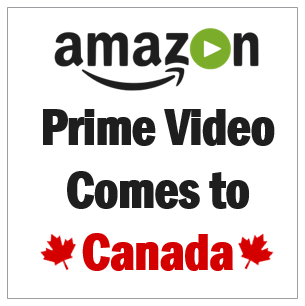 Apart from Canada, Amazon has expanded its Amazon Prime video-streaming service to over 200 other countries including India. Amazon Prime Video won’t be available in China because of its stringent regulations and censorship. Amazon Prime Video members can also download movies and TV shows for offline viewing on mobile devices. Amazon Prime Canada costs CAD79 per year and existing Prime members will get Prime Video at no additional cost. Prime membership comes with many other benefits as mentioned below. If you don’t yet have Amazon Prime, you can take it for a Free 30-day test drive. With Amazon Prime membership, Canadians can enjoy FREE Two-Day Shipping on millions of items, ad-free Twitch streaming, unlimited photo storage on Amazon Drive, and exclusive Prime Early Access to deals. Prime members in the United States get a lot more bang for the buck and you can watch the video below for a Comparison of Amazon Prime Benefits in US and Canada. Amazon Prime also makes a great gift, so you can gift it to your friends and family for any occasion. Also, students get special 50% discount on Amazon Prime Membership. Students get a 6-month trial period. and get 2-Day Free Shipping on millions of products sold on Amazon. AFFILIATE DISCLAIMER: If you use the affiliate links above to purchase any products, I may earn a commission as an Amazon affiliate. This recommendation and review is based on my firsthand experience using these products myself or based on my personal research. CREDITS: Amazon Prime and other images, banners, graphics used in this video are used as an Amazon Associate, unless otherwise mentioned | Amazon and the Amazon logo are registered trademarks of Amazon.com, Inc., or its affiliates, in the United States and other countries | Microsoft, Windows, and the Windows logo are trademarks, or registered trademarks of Microsoft Corporation in the United States and/or other countries. Logos and screenshots used with permission from Microsoft | Other company names may be trademarks of their respective owners.